A counterfeit and substandard medicine detection device - called PharmaCheck - is due to start field trials in Ghana and Indonesia in 2014. Moreover, PharmaCheck has also been named as one of the top 10 world changing ideas for 2013 by Scientific American magazine. 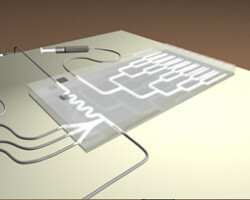 The shoebox-sized device was originally developed at Boston University with backing from the US Pharmacopeial Convention (USP), and is billed as a high-throughput, portable, user-friendly detector for screening essential medicines such as antimalarials and antibiotics. The microfluidic device quantitatively analyses active ingredient levels and other characteristics, such as the dissolution rate of tablets, to identify whether a drug meets quality criteria. It can be applied to solid oral dosage forms and liquid suspensions. "Existing methods of counterfeit drug detection are bulky, qualitative, error-prone and do not take time-based measurements of drug release kinetics, and thus do not provide information about whether therapeutic levels of the drug are reached and sustained," according to Boston University associate professor Muhammad Zaman, who leads the team developing PharmaCheck. The device "addresses these shortcomings through affordable fluorescence, dissolution testing, which allows for highly specific and quantitative time-course measurements of drug release," he said, adding that providing data on dissolution rates differentiates PharmaCheck from other technologies.